The secrets of mastering, and the hardware required to do it, used to be kept firmly locked behind studio doors. However, while it’s still a process that requires a distinct skill set, today’s high-quality plugin processors mean that it’s now perfectly possible to master your music at home. If you’re going to go down this road, though, you need to make sure that you have the right tools for the job - the same tools that the pros use, in fact. 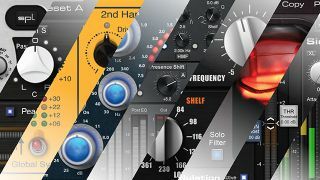 Plugin Alliance has world-class mastering plugins from seven highly-regarded developers on its roster, so if you want to add some genuine studio polish, it’s got you covered. Contrary to what you might think, mastering isn’t just about making your music loud; it’s about using a carefully-selected set of processors - EQs, compressors, limiters, saturators and spatialisation tools - to refine your mix and make it sound as good as it possibly can. One developer that specialises in precisely these sorts of tools is Brainworx; its bx_digital V3 plugin, for example, is an M/S mastering EQ that can filter with surgical precision, and is perfect for your master buss. The internal M/S matrix in bx_digital V3 lets you treat mono and stereo information separately, lending more depth and clarity to your master. It also has a handy ‘Mono-maker’ knob that folds any frequencies to mono below the cutoff, so that you can ensure the low end stays in phase and in check. The bx_XL V2, meanwhile, is a mastering limiter that also splits your signal into Mid and Side components. In a similar manner to bx_digital V3, this lets you create a mix that’s loud and transparent and doesn’t sound squashed. Before you hit your mastering limiter, you can tame peaks and add some gain with the bx_limiter, while the bx_panEQ has three bands that enable you to cut or boost at any point across the stereo panorama. This means that you can make any last-minute EQ corrections to instruments in the track without having to go back to the mix; for example, reducing the harshness on a hi-hat that’s panned 15 degrees left of centre without affecting the brightness of the rest of the mix. Other Brainworx offerings include bx_refinement, a truly unique plugin that can be used to remove harshness and unwanted high frequencies. It imparts a warm, ‘tube-like’ character to sounds and even has the ability to modulate its de-harshing function in time with your music. The transparent and M/S-capable bx_saturator V2 also adds tube-like warmth, but can be pushed even harder to add perceived loudness and body. You can keep an eye on RMS and Peak levels with the bx_meter, as well as useful K-scaling to compare against multiple dynamic range standards. The Plugin Alliance catalogue features plenty of other mastering essentials, too - Dangerous Music’s BAX EQ, for example,can be used to cut the mud and subsonic rumble from a mix. It’s based on the same Baxandall filters one might find on a hi-fi stereo system, and has the same transparency in its response curves. The soothing elysia alpha compressor is great when you’re looking to add a finishing touch, providing a comprehensive solution to delicate dynamics management that also sports M/S technology and some really useful filtering tools. Pro Audio DSP’s DSM V2 performs the clever trick of using FFT analysis to capture the dynamics of a piece of audio and impart them onto another source, while the SPL Passeq can deliver some of the most elaborate EQ curves possible. As if all of that wasn’t enough, Plugin Alliance can also offer you the M/S-capable Vertigo VSM-3, a surgical tone box that can increase perceived loudness and presence, and Black Box Analog Design’s HG-2, a faithful recreation of the mix buss saturation masterpiece that sounds good on pretty much anything. These are the kinds of tools that, just a few short years ago, mastering engineers could only have dreamed of having access to, and they’re all ready to be demoed in your home studio right now. To find out more, head to the Plugin Alliance website, and start creating the mastering setup that you’ve always dreamed of.